From Adelaide Airport: Henley Beach is an easy 10 minute drive along Henley Beach Road from the airport. A taxi will cost approximately $15. From the City : Drive west along Henley Beach Road from Adelaide, and you’ll be in Henley Beach in 15 – 20 minutes. A taxi from city will cost approximately $25.00. 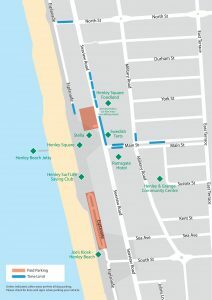 There’s plenty of on and off street parking in and around Henley Beach – some of it timed. The two carparks immediately adjacent to Henley Square are timed – 3 hours max. The undergound carpark under Henley Square Pavilion (enter from Military Road) offers 2 hours free parking when the shops in the Pavilion are open. More info about parking here. The H30 bus, follows a direct route from many Adelaide tourist attractions to Henley Beach and Henley Square. The bus stops in front of the Botanic Gardens and Art Gallery on North Terrace, travels past Rundle Mall, and straight along Henley Beach Road to Henley Beach and the Square. There are also buses from Harbour Town and Glenelg in the south or Grange, West Lakes Shopping Centre, Semaphore and Port Adelaide in the north. Keen cyclists can ride along the River Torrens Linear Park to and from the city and Henley Beach. 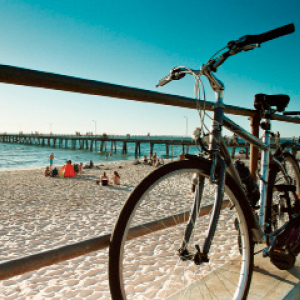 Bikes are available for use at no charge from Henley Beach and many locations in the City.